I just fell in love with this Sweetie and had to paint him. He is a good boy. 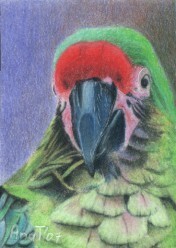 To see more of my art cards please go to ArtCardsWanted or to Tirolese.com. Wow, Ana this is so beautifully done ...I adore it !!! You're a master when it comes to draw with pencils !!! Bravo !! !